Daily Motivation: What Made Elvis the Legend We Know Today? There is a mystical aura about people who become legends -- that something extra that sets them apart, making them a little more than just mere mortals. With legends, the last name usually does it for recognition like Bogart, Monroe, Sinatra, Dietrich` but there is one legend who is so close, so familiar that we refer to him by his first name; Elvis. But what exactly was it that made Elvis Presley a legend? It is well known today that most people need daily motivation and use goal setting to identify their goals and career paths to achieve their dreams. Elvis was fortunate that he had a mother who doted on him every minute of the day and BELIEVED in him, and expected him to be outstanding and exceptional in his life. This definitely helps you to grow up simply expecting the best for yourself in life. But for most of us, we need to create our own tools and strategies to achieve success. Helping to identify your 'strengths' and working on yourself to improve areas where you are 'weak' is a first step. 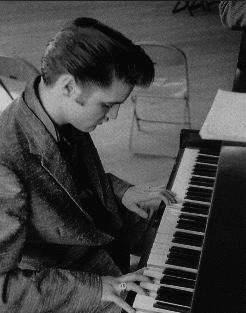 Elvis worked hard to become the star he was, he practiced the guitar and piano, pretty much self-taught. He had a dream of becoming a singer, and as a child even performed "Old Shep" in State Fairs, so its safe to say he practiced and rehearsed, and visualised himself on the stage and being a singing star, since his childhood. Be like Elvis and see what is 'unique' about yourself and apply them to your future dreams. Clean-cut white rock and roll was the popular music in his era but Elvis took this seemingly tame genre and changed it overnight. With his gyrations, frenzied dancing, vocal styling, sensual good looks and unabashed sexuality, Elvis produced an image of fun and good times with a healthy dose of sensuality. It outraged conservatives but it earned Elvis millions of young fans. His live performances and TV appearances only cemented his growing popularity. His music was hard, fast and extremely potent. Elvis became a highly commercial success. His records topped the charts, his concerts were sold-out and he even starred in 33 films. Today, his record sales have topped the one billion mark, making him the most saleable artist in history. Elvis' legend is multi-faceted, composed of his unique and witty style and image which richly combined his sensuality, appeal and sense of humor. Add to that the numerous stories of his good will and humility. His fame has grown over the years and continues unabated to this day, fed by a strong cult following. Elvis probably never knew he'd become a legend and he would probably be looking on in amusement if he were alive today, but his impact on popular culture and on the lives of millions has undoubtedly made him the legend we know and love. At our website you can learn how to visualise your life dreams and apply the law of attraction, as well as practical self improvement lessons for every day of the year. You can also download a free daily 365 Success Quotes ebook filled with inspiring quotes to keep you motivated to achieve. The power to change anything in your life that you want to change. The rare ability to control your own behaviour on a daily basis to create and maintain a lifestyle by YOUR exact design. IT`S TIME that YOU enjoyed a feeling of peace, joy, happiness and excitement about your life!